Restaurants across the country implement a 19th century French technique. "I always say that classics are classics for a reason," Ryan Ratino declares. That philosophy is what led him to bring a 19th century French technique into his contemporary kitchen at the Michelin-starred Bresca in Washington, D.C. The duck press is a wide, piston-like device that's used to extract the blood and marrow from a duck's bones to create a uniquely rich sauce to accompany the breast meat. This hefty piece of equipment uses a screw-down plate controlled by a wheel to compress the cooked bones and squeeze out every last drop of juice in a dramatic tableside performance. The technique is a time-tested example of whole animal cooking. "The sauce is made directly from the bones from that same duck that you're eating right in front of you," Ratino says. "For me as a chef to know that I utilized the whole thing, literally not one piece of that animal went into the garbage—it's satisfying." 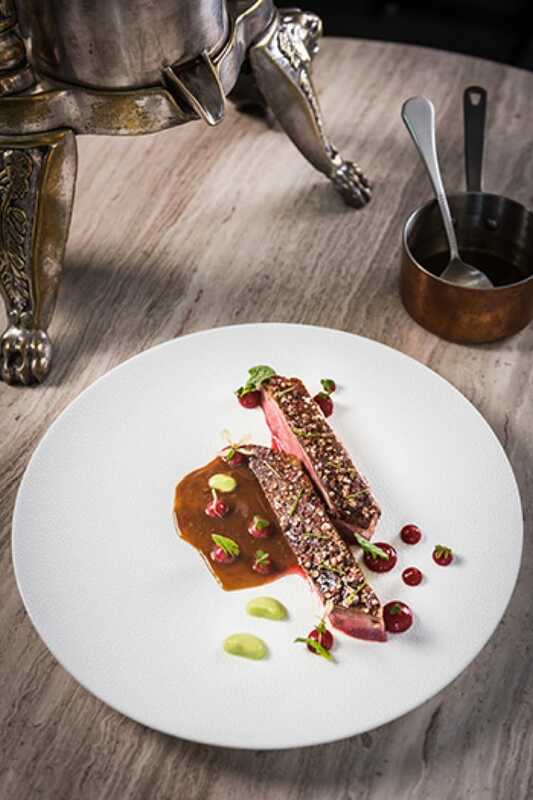 Though the duck press is iconic and revered in French cuisine, Ratino had never worked with it or even tried the resulting dish, canard à la rouennaise (duck in blood sauce), before implementing it at Bresca. When it came time for him to introduce it to his diners, he decided to do so without the pomp and circumstance it's afforded in high-end restaurants like Tour d'Argent in Paris. "This used to be a necktie, suited-up occasion, and we brought it into this much more contemporary style of dining where it's relaxed," Ratino says. "We treat the ingredients the same way, but in a much more approachable, fun environment." His vision, however, proved challenging to execute. Ratino quickly found that the price of a quality press can range from $10,000 to $40,000. "I was like, 'We're never going to be able to do this,'" he recalls. That is, until Ratino learned that the founder of D'Artagnan, Ariane Daguin, happened to have a press decorating her desk. He asked if she'd be willing to loan it to Bresca. "It's been in her family for a long time, and she was like, 'It's just sitting here—put it to use.'" "I had no idea what I was getting into," Ratino recalls. "From the time we received the duck press, it took us three months until we actually served our first duck. We couldn't cook the sauce to save our lives." The sauce is deceptively simple, because the only thickening agent is the blood and marrow from the press. The problem is that the blood can easily coagulate, resulting in an unpleasant texture. "We went into the science behind what's happening and then we started messing with the pH levels of the sauce. This is where cooking gets fun," Ratino says. "There's more to it than just whisking in blood or just heating up a pan." Once they perfected the sauce, Bresca began serving the duck press nightly. "It's the best sauce I've ever cooked in my life," Ratino says. 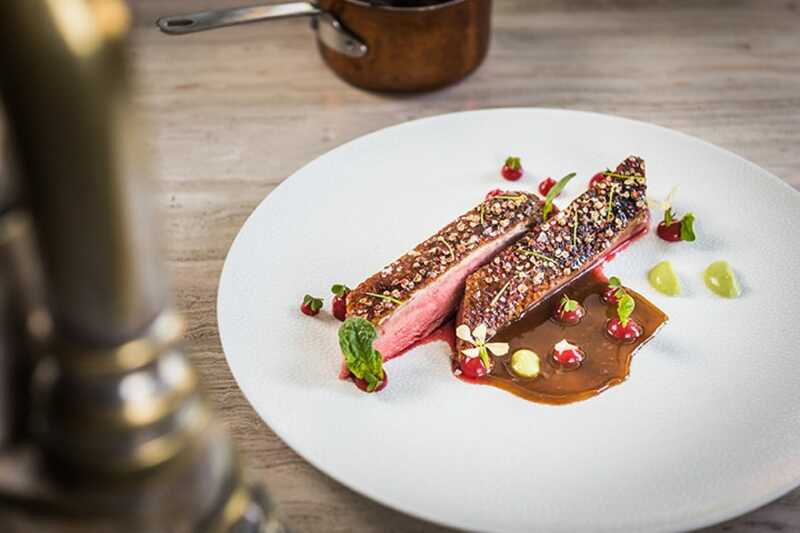 The accoutrements vary, but currently, the glazed, spice-crusted duck breast in sauce is accompanied by an apple salad, oat milk bread and a savory tart of the leg and thighs with apple mostarda. Before they are roasted whole, the birds are dry-aged for 21 days. The restaurant's compact kitchen means its inventory is limited and it offers just four ducks a night on a first-come, first-served basis. Word about the theatrical dish has gotten out around the city, so during the colder months, the duck press sells out within 20 minutes after service begins on the weekends. The dish is still a rarity in modern restaurants, but several other chefs around the country utilize the duck press, some more regularly than others. At the old guard New Orleans restaurant Commander's Palace, executive chef Tory McPhail rolls out the Brennan family's antique press for special occasions. "It's very exclusive and very luxurious to have a duck press, and doesn't happen normally for service," he says. It's presented at the chef's table about once a year. 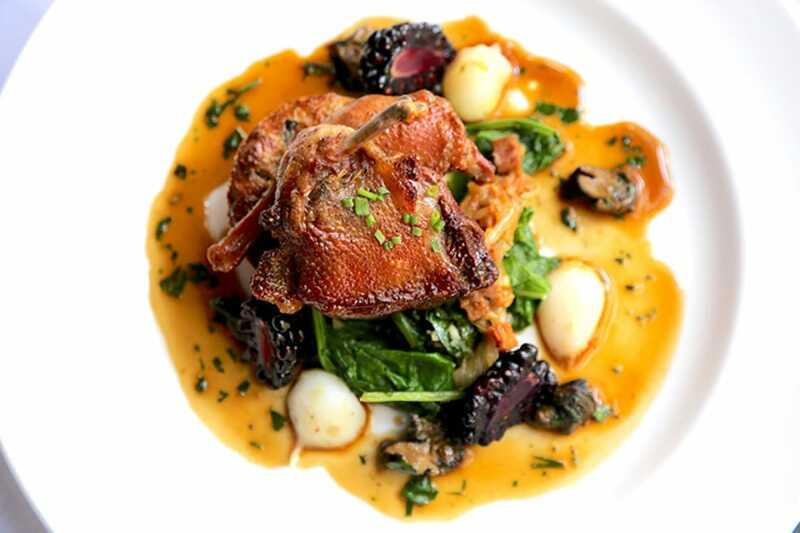 Chef Michael Lomonaco had been working with the duck press for years before implementing it at his restaurant, Porter House in New York. "As a meat-centric, carnivore-forward restaurant, I believe this tradition should be kept alive and revitalized," he says. He offers the duck press on a pre-ordered basis, and it's most popular during the fall. "Diners are mesmerized and thrilled," he adds. 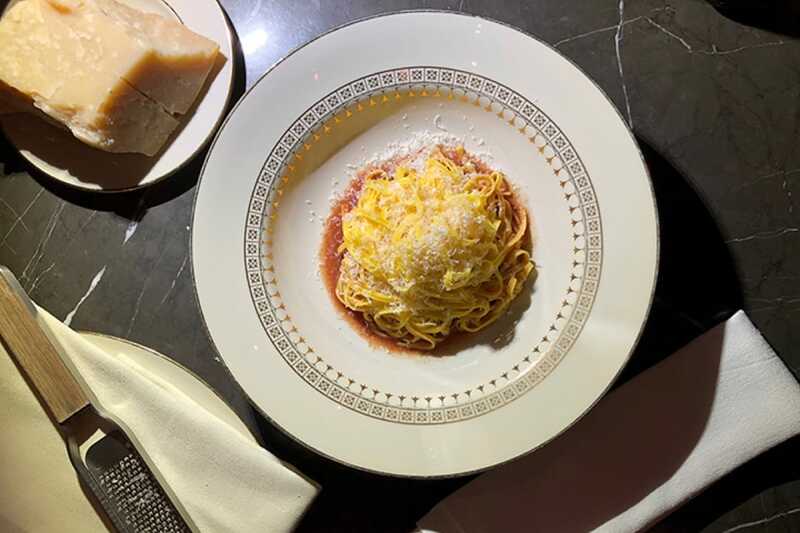 The Grill in New York shares Ratino's approach of incorporating the extraordinary into the everyday. 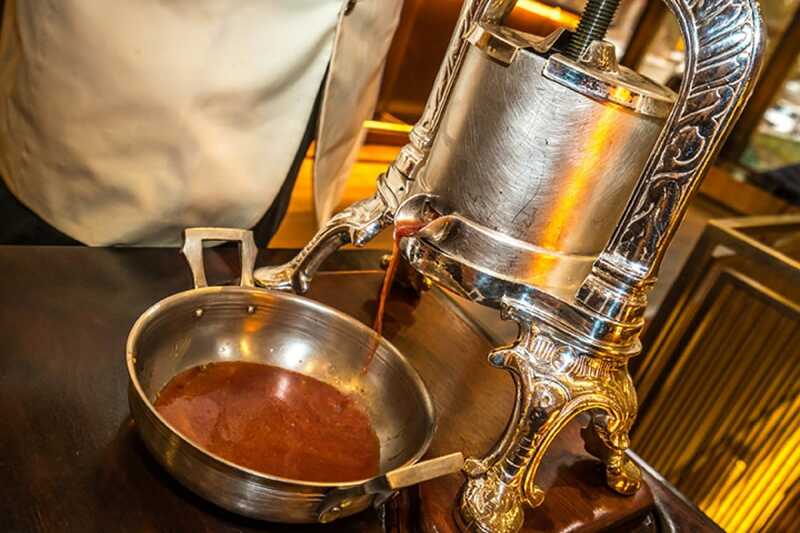 Chef Mario Carbone decided to use the press to make a rich duck jus for pasta. The restaurant has a 200-year-old press that it bought from an antique shop in New Orleans for $22,000. It's used an average of 22 times a night. At Bresca, Ratino now has two duck presses, just in case the loan on the D'Artagnan press expires. "I purchased a duck press from an antique shop that didn't quite know what they had," he says. "We got it for 10% of what it should have costed." The second press is not as ornate as the borrowed one, but thankfully, Daguin doesn't seem to be in a hurry to reclaim her piece. She visited the restaurant a few weeks after it was awarded its Michelin star. "She had the duck and was in love with it," Ratino says. "I was like, 'Let me know when you want it back,' and she's like ... 'just keep using it.'" "This is my favorite thing to cook," he says. "There's so much lost art in one dish." Hero and side image courtesy of Bresca. Photos by Rey Lopez. Lani Furbank is a freelance food, drinks, and lifestyle writer based in the D.C. area. 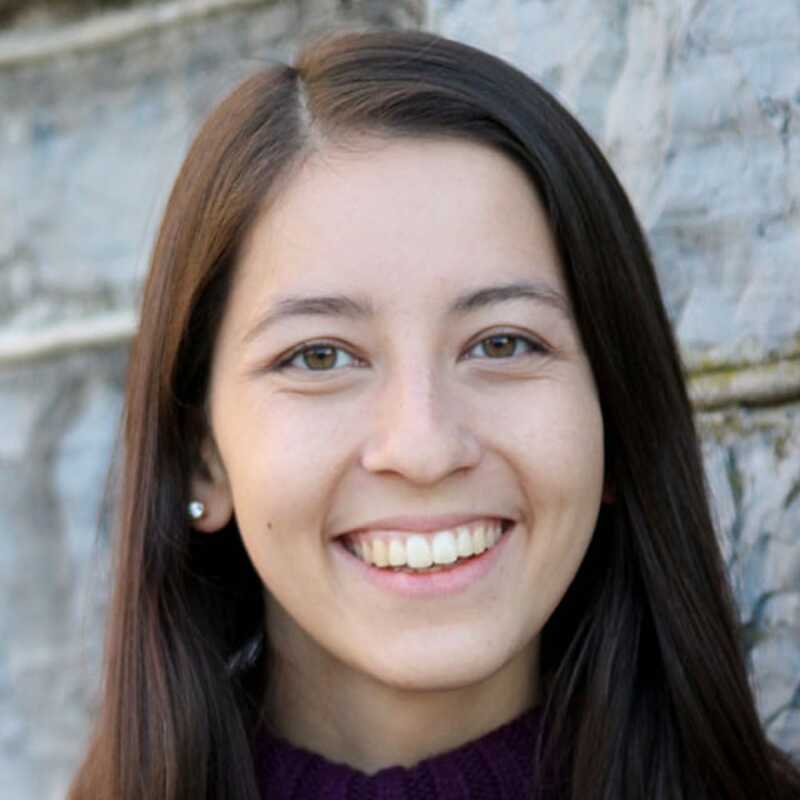 She was born and raised in Northern Virginia, but stays true to her Welsh-Taiwanese heritage by exploring new places and experimenting with recipes from around the world. Read her work at LanisCupOfTea.com. Three experts weigh in on what to look for in selecting this vital kitchen tool.